Product prices and availability are accurate as of 2019-04-21 11:53:06 UTC and are subject to change. Any price and availability information displayed on http://www.amazon.com/ at the time of purchase will apply to the purchase of this product. 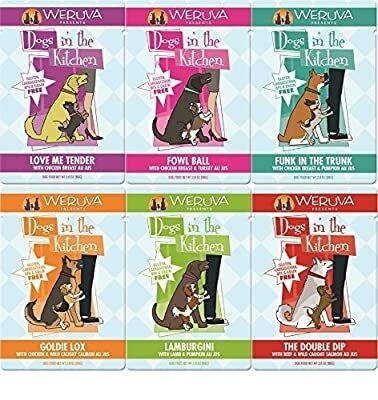 Dogs in the Kitchen Variety Pack: 2 of each 2.8 ounce pouch - Love Me Tender, Fowl Ball, Funk in the Trunk, Goldie Lox, Lamburgini, The Double Dip. Grain, Gluten, MSG, GMO, and Carrageenan Free! Pumpkin added for better digestion! Variety makes every meal exciting! Stew style wet dog food!